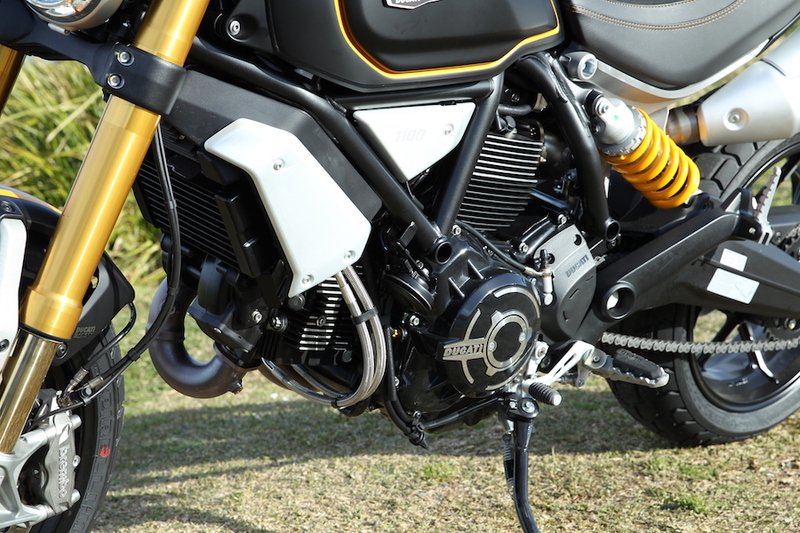 Why?” That was the first question lots of people asked when they spotted the new Ducati Scrambler 1100 Sport. 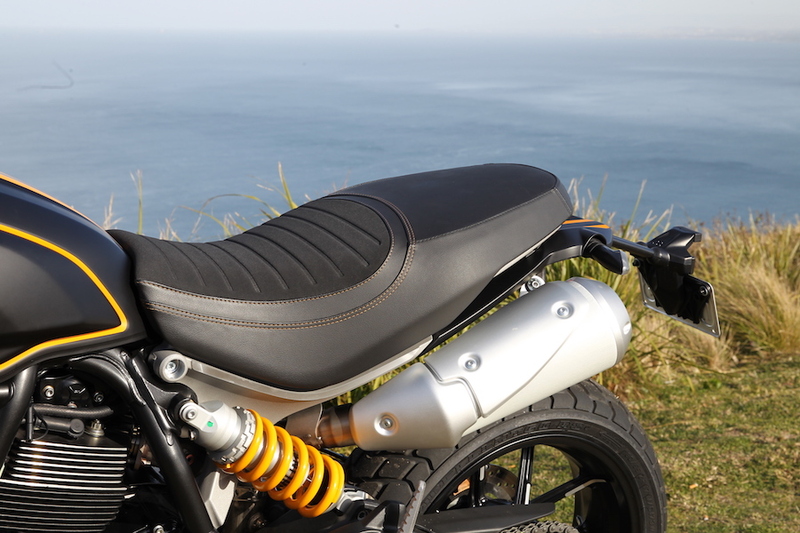 To many, the Scrambler has always been about mid-capacity urban cruising. Simple in design and free of any confusing electronic switchable stuff. 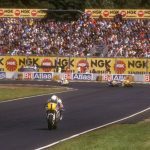 Its design brief was to bring joy to the art of motorcycle riding. Hell, it doesn’t even require water in a radiator – you can’t get much simpler than that. The Scrambler has been such a success since its early 2015 release that it quickly became a brand within a brand. 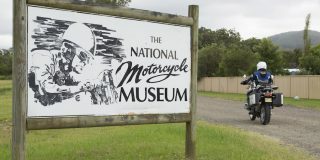 Scrambler’s ‘Land of Joy’ is about all things yellow – 62 Yellow – a place where you have the bike, the T-shirt and stream the Land of Joy radio station. Almost 50,000 Scramblers have been sold in that time. 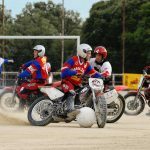 We all know the Scrambler isn’t an entirely new Ducati model – the Bologna-based manufacturer produced the original Scrambler from 1962 until 1976 in various single-cylinder capacities – but the first of the new-age Scramblers was an 803cc air-cooled V-twin that sprouted numerous offshoots, including the Flat Track Pro and a proper off-road machine in the Desert Sled. The 399cc LAMS-approved Sixty2 cashed in on the new-rider market with great success; affordable and almost identical to its larger-capacity sibling, it provided an entry point to Scrambler life, with the target being to get onto a full-blown 803cc Scrambler when the licence permitted. Everything was looking rosy in the Land of Joy. That was until riders began to yearn for more. It’s a basic human instinct to want something better than you have; it’s what drives many of us. The 803cc Scrambler is a great bike, but there was always going to come a time for some owners when 56kW was no longer enough, and at that point the Scrambler brand risked losing riders seeking more power. 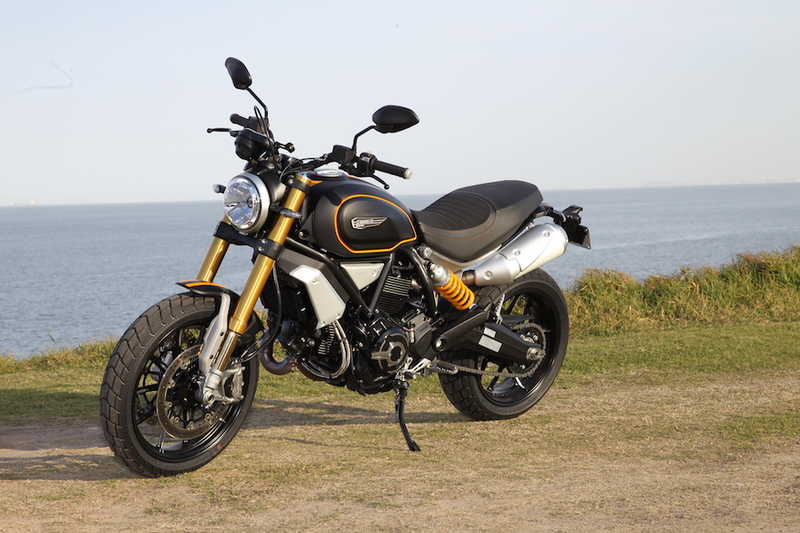 To combat this, Ducati has not merely shoved an 1100cc engine into the existing Scrambler and pushed it out the door, it has produced an all-new model. The fact that it looks just like all the other Scramblers is quite an engineering feat. But under the familiar facade is a raft of firsts for the model, including switchable riding modes, traction control, an Inertial Measurement Unit (IMU), twin front brake discs and adjustable suspension, span-adjustable clutch and brake levers, and even self-cancelling indicators. 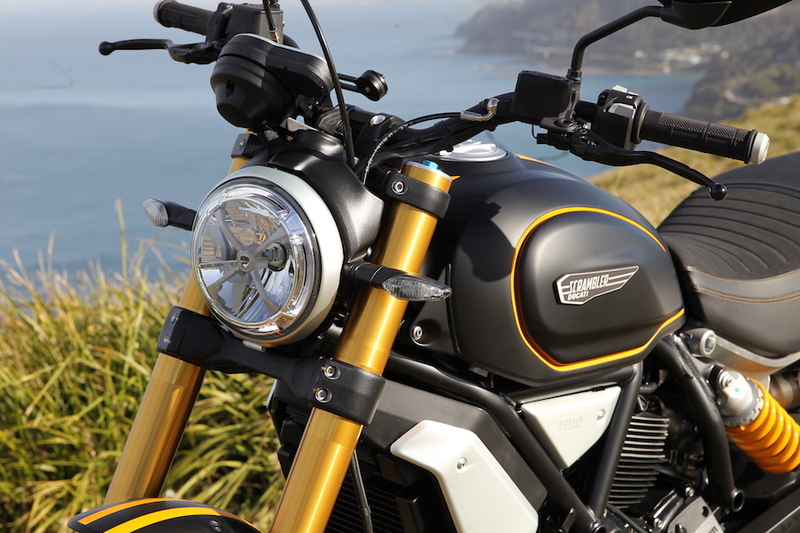 At the heart of the new Scrambler is something not so new, the 1079cc V-twin engine. The Scrambler’s uncomplicated design brief dictated that air-cooled is the way to go, and Ducati had just the thing – the delightfully punchy engine from the now discontinued Monster Evo 1100. Euro4 had come into effect since the last Evo rolled off the production line, so a few internal changes were required, as well as a new exhaust, and the updated unit now puts out a respectable 63kW and 88Nm. 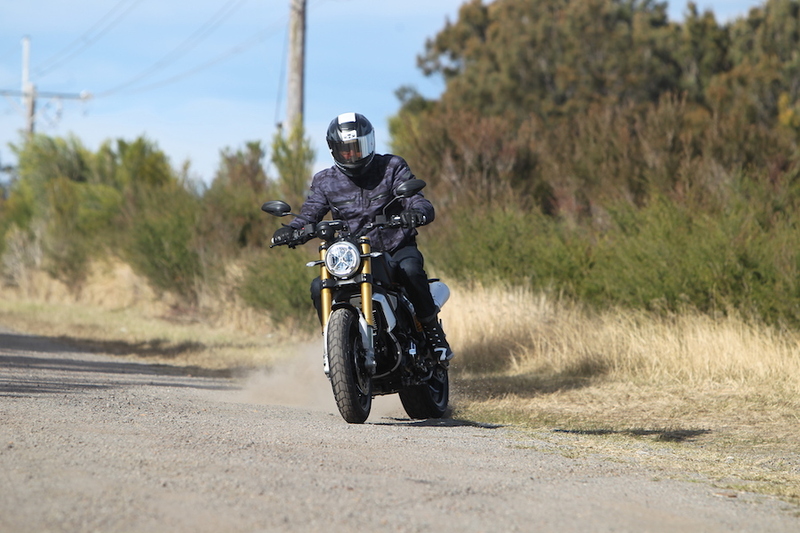 Three versions of the Scrambler 1100 are now available in Australia, the 1100, 1100 Special and 1100 Sport, but expect the range of models to multiply, just as its 803cc sibling did. 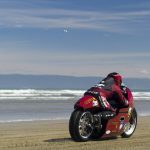 The range is based on a single engine and chassis platform, with the Sport fitted with 48mm Öhlins fork and shock, replacing the 45mm Marzocchi/Kayaba kit on the lower-spec 1100 and 1100 Special. The Special is the only model equipped with wire-spoked wheels, which adds 5kg to the package (to a claimed dry weight of 194kg, up from 189kg). 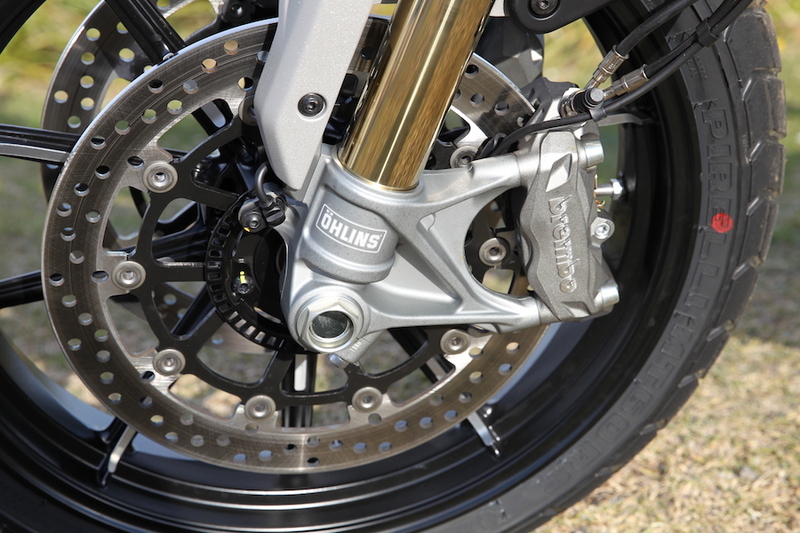 Our test bike is the top-of-the-tree Öhlins-shod Sport model. As well as being larger in just about every area, the new model also has a meaner look than the middleweight offering, due to a larger fuel tank, beefier fork legs and twin-disc brake set-up. 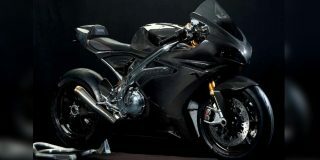 Around the tail of the bike is where the major styling changes occur. Two big, menacing exhaust cans exit on either side of the pillion seat, promising all sorts of wonderful pops and bangs from the big V-twin. Sitting on the bike is where I really noticed the 1100’s increased proportions. The seat sits at 810mm – 20mm higher than the 803cc model – and the handlebar on the Sport and standard 1100 are also flatter and lower than the Special’s, so the reach to the ’bar feels longer and wider. The signature LCD circular dash remains, and the need for more display space to accommodate the electronic aids has resulted in an additional slimline screen being added. 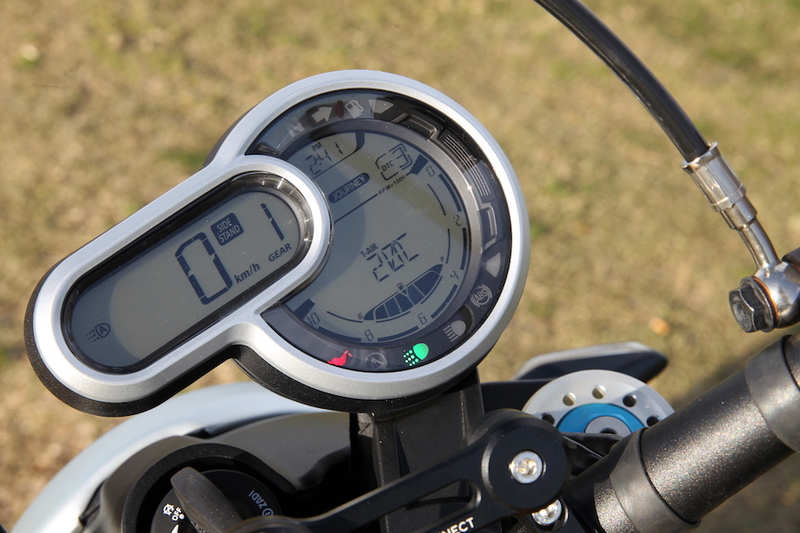 The speed display has moved from the centre of the face to the secondary LCD, which also shows gear position, headlight and side-stand warning. The centre of the main display is where the scroll-through tripmeters and settings now reside, with the riding mode selection menu above, and the tachometer runs from right to left in an inverted arc around the bottom of the clock, something that makes as much sense to me as reading an upside-down book reflected in a mirror. 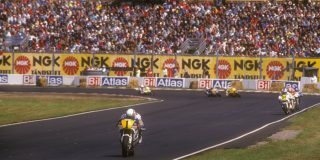 I had forgotten just how good the big-bore air-cooled Ducati V-twin sounds. It bursts into life with a loud bark before settling into a restless idle, popping and growling, with moving parts chiming in with mechanical clatter. As good as the new range of water-cooled Ducati V-twins engines are, for me they have become too refined, losing some of the soul that is Ducati. The only thing missing from the mechanical symphony is the rattle of a dry clutch, but some things are best left in the past. A quick stab at the throttle reveals a crisp and immediate response to even the smallest input, hinting at how smooth the ride was going to be thanks to the well-sorted fuelling. 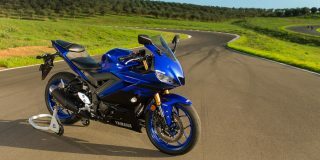 The span-adjustable clutch and brake levers are a welcome addition, and the clutch lever is light from the slip-assist clutch, albeit with a notchy feel when you select first gear. 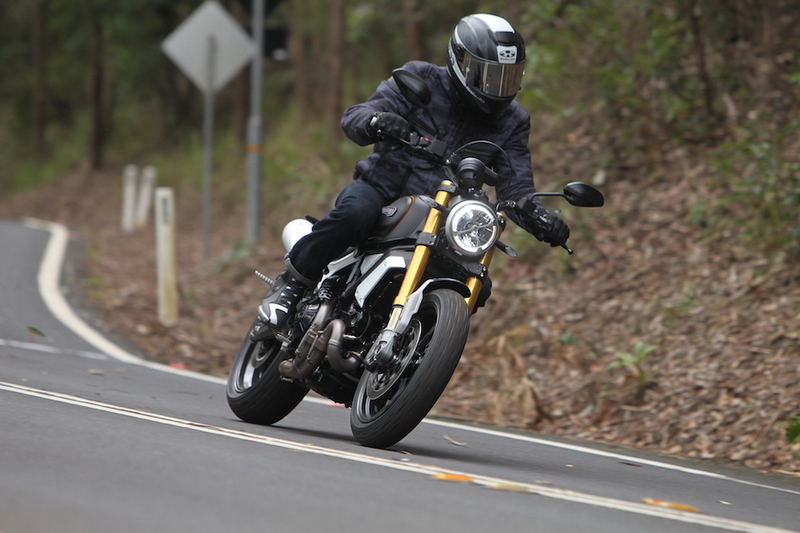 Even at low speed the exhaust note turns heads, and I was surprised at how many people knew the Scrambler range and identified the 1100 Sport as one of the new models. With a maximum width of 895mm, I was concerned about lane filtering, but the low-speed stability is spot-on, allowing me to slice between rows of stopped cars with ease. And because it’s such a high-set bar with even higher mirrors, there’s little chance of catching a car’s mirror. Despite looking similar, Ducati claims the trellis frame is an all-new affair, with a twin-spar design coupled to an aluminium subframe. Machined aluminium has also been used on the engine, alternator and belt covers to give the Sport a premium look. 3.5 inches wide, replacing the 3-inch unit, with a 120/80 tyre replacing the 110/80. The steering geometry is slightly different too, with a 24.5° rake and 111mm trail replacing the 24°/112mm dimensions of the 803cc chassis. My favourite test route features a lovely long right-hander followed by a steep, twisting incline that signals the start of the fun. From the apex, I wind the power on in second and the Scrambler drives up the hill emitting a purposeful howl. Up into third gear and hard on the gas, I begin to tip the bike into the series of left and right bands that wind their way up to the summit of the hill. It’s here I notice just how wide the handlebar is. The bike turns in nicely and goes exactly where you want it to; the handlebar length provides plenty of leverage but also a lot of movement. The 1100 is the first Scrambler to be fitted with switchable engine maps, and in typical Scrambler fashion they are called City, Journey and Active; the last one made me think of a gym workout. City would otherwise be rain mode and limits the power output to 55kW, Journey is the same as a touring mode, providing the full complement of 63kW but in a more metered fashion than the next step up, which is Active (sport). This mode also provides full power but with crisper throttle response. 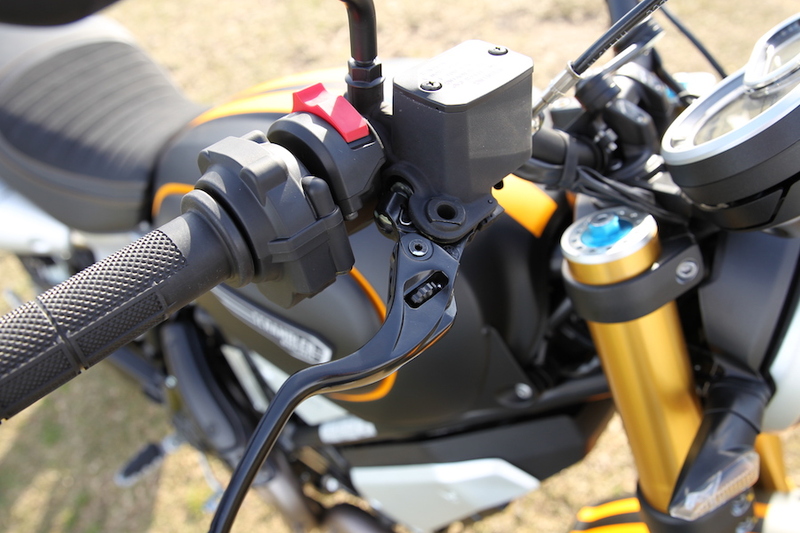 Each of the three riding modes can be customised with a choice of Low, Medium and High power/throttle-response settings, as well as five levels of traction control, which can also be turned off. Changing between modes can be done on the fly, it’s a case of pressing and holding the indicator button then using a slide toggle to move through the choices; however, getting into and customising the power and traction control setting for each of the modes is a bit trickier. There is also no option to deactivate the ABS. I did take the 1100 for a quick blast up a dirt road, but I don’t think many people will, at least not until the Desert Sled arrives with an Enduro mode that will probably deactivate the rear ABS. I wondered if traction control is a necessity on this bike (and a few others I have ridden lately). From a marketing point of view it makes sense, but the big V-twin is so well mannered that a sensible right hand will do the job. I selected Active mode and turned the traction control down to Level 1. 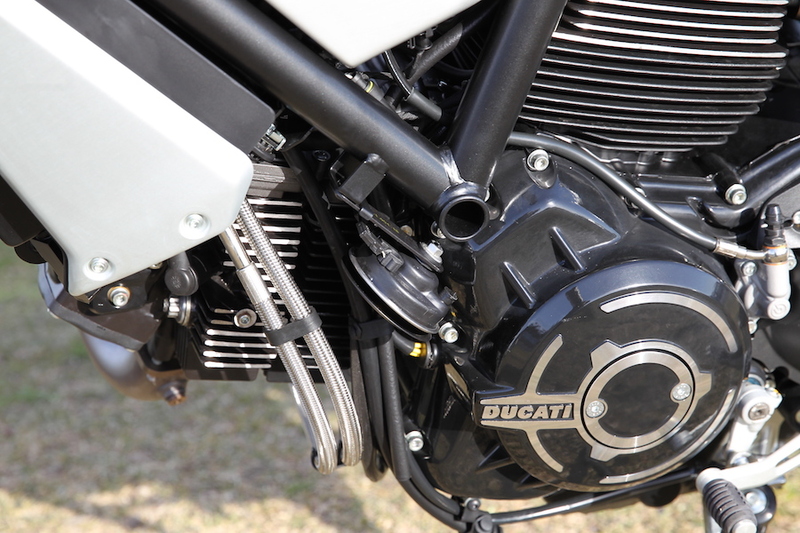 The 1079cc engine makes most of its torque from well down in the rev range; it’s so easy to ride and power out of corners, and the fuelling is smooth, defying the raucous noise coming from the twin cans. The 63kW maxes out at 7500rpm, so there’s no need to rev it hard. I rode the bike mostly by ear because the tiny reverse-reading, upside-down tacho is impossible to read at speed. With the traction control in L1, I try for a clutch-up wheelie in second gear – nothing. Okay, first – nothing. Then I remember the 1100 has an IMU, which senses changes in pitch and yaw, and gently cuts the fuelling to keep everything pointed in the right direction. It also reads the lean angle (roll) and provides a level of traction control and ABS to suit – all stuff only available on wildly expensive top-level bikes just a few years ago. 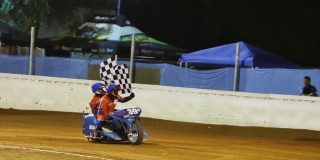 It felt like it was hitting a soft-cut rev limiter the second I gave the clutch lever a flick. Deactivating the traction control in Active mode fixed the issue but then I wasn’t using something I may have paid good money for. Real-time data is used by the traction control and the Bosch 9.1 ABS to determine how much torque to provide, or braking force to apply, based on the speed and lean-angle. It’s brilliant technology, but to engage a more experienced rider, perhaps L1 should allow a small amount of rear wheel spin and front wheel lift. With the TC off and throttle response set to High, I set about having a bit of fun. I expected it to be a soft ride, but the suspension is firm, tightening everything up and offering a high level of feeling from the chassis. 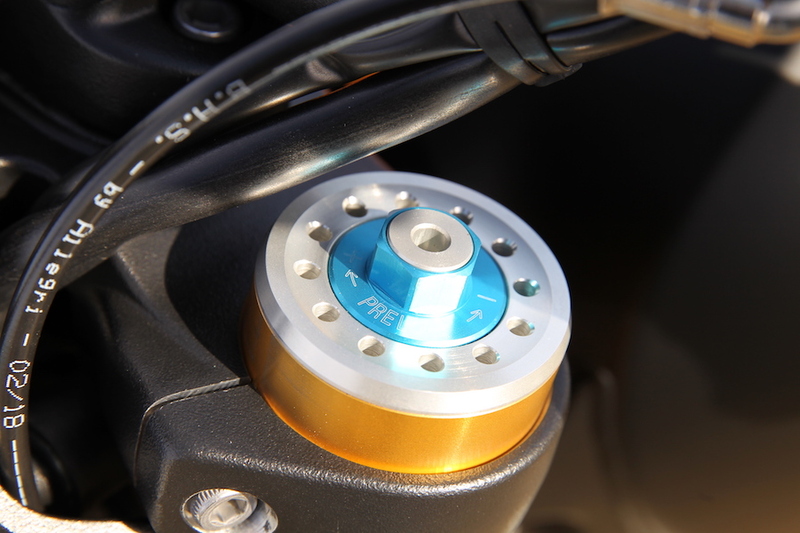 With 150mm of travel in the front suspension, there is noticeable dive when the four pistons bite into the twin 320mm discs, but that’s to be expected from a tall bike (and tall rider) with such an upright riding position. The suspension is fully adjustable at both ends, and there’s an Allen key in the underseat toolbox for adjusting the compression and rebound, which are separated into the left and right fork legs. There’s also a C-spanner for the rear-shock preload. 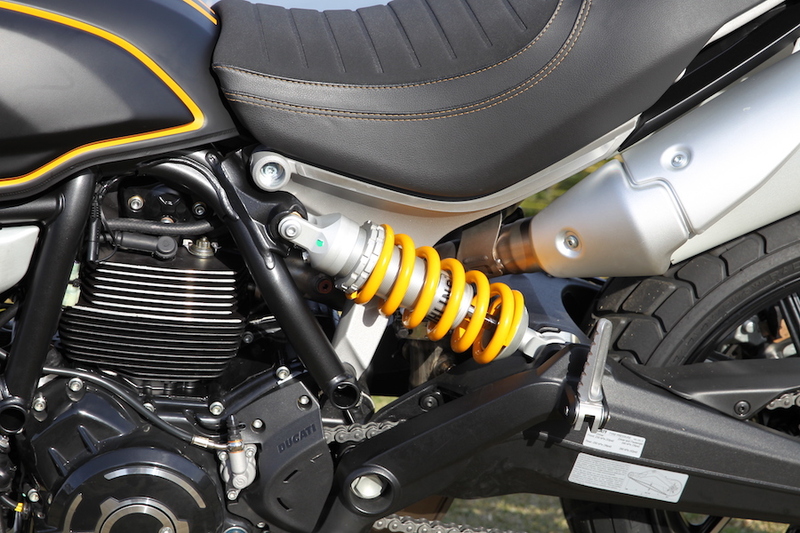 The adjustment point for the rear shock is on a tricky position, obstructed by the frame. On a reasonably smooth road, the bike felt comfortable and stable at speed, but it did begin to bounce and bash me about a bit when faced with a B-grade road surface. I’d be interested to see how the 1100 and 1100 Special handle the same bit of road with their plusher suspension. 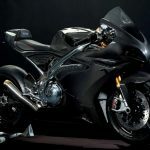 The bike turns in nicely and holds its line well, but is a bit slow when faced with a sudden change of direction – then again, it’s not a Panigale, despite sharing the same 24.5 degrees of rake. I always thought the first Scrambler felt like an old-school chook chaser, but the 1100 even more so. That’s what makes it a heap of fun to ride. What doesn’t feel like an old-school chook chaser is a great engine pushing it along. Everything about the air/oil-cooled V-twin is enjoyable. 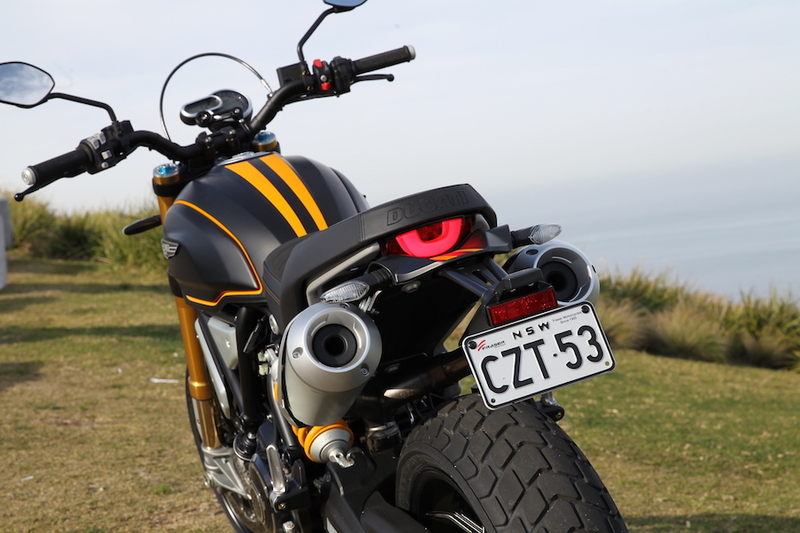 The grunt-filled lower revs make any one of the first three gears good for a fast corner exit, the sound is as enjoyable as any pre Euro-4 Ducati, and the smell… well, there’s nothing like getting a couple of nostrils full of the scent of a warm air-cooled engine when you stop at the lights. I’m not sure how comfortable the twin under-seat exhausts would be for a pillion on a hot day, but maybe that’s a good excuse to upgrade to the aftermarket Termignoni Racing exhaust (see sidebar), or only ride solo. 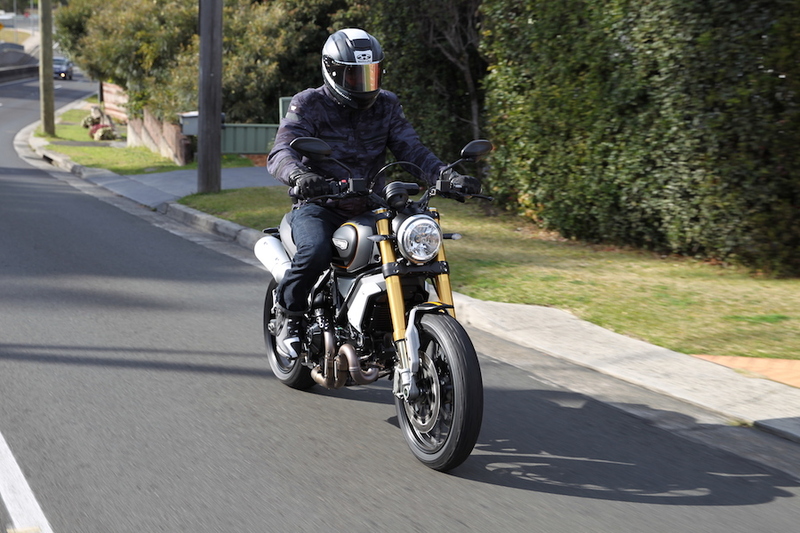 Riding a Scrambler is all about fun, and the 1100 delivers heaps of it. Sure, 63kW could be considered a bit wheezy for an 1100 these days, but it’s not short on poke in the lower revs, and that’s where the fun happens. 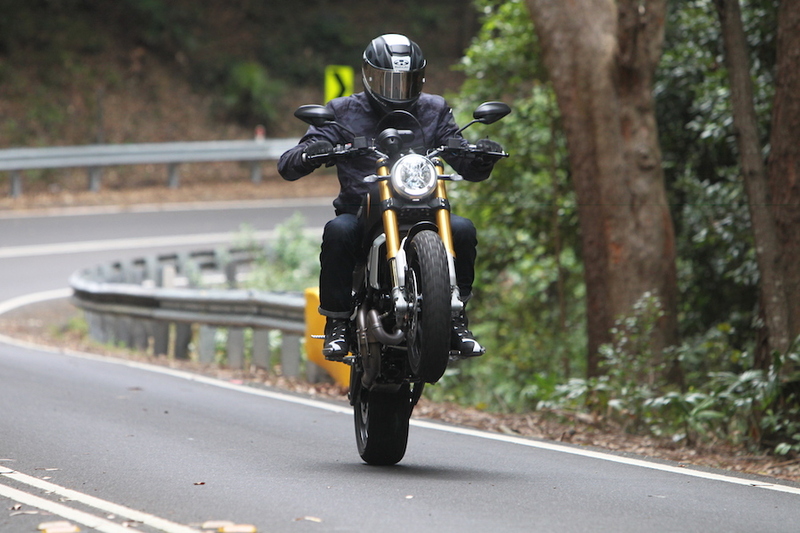 If you’re looking for something big, ballsy and naked in a Ducati, the Monster 1200 is what you’re looking for, but for pure fun with a decent dollop of grunt and noise to match, the Scrambler 1100 is your choice. The base-model Scrambler 1100 is also considerably cheaper than the base Monster 1200 ($17,990 versus $20,990), leaving a few bucks in your skyrocket for upgrades. 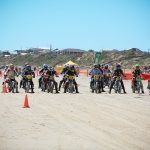 After plenty of time on the Scrambler 1100, I now had answers for when people asked me ‘why’? 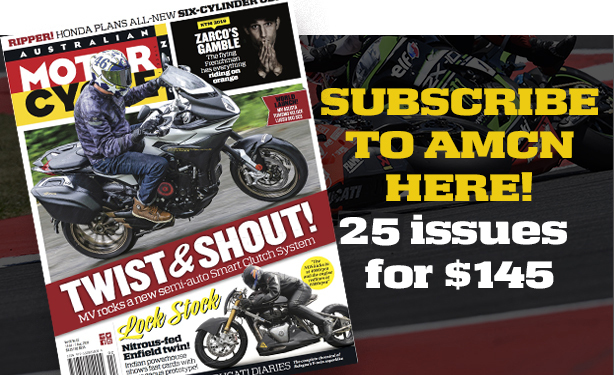 There’s no shortage of manufacturers with a big-bore retro bike in their stable, so Ducati was missing out on a slice of that pie – and it’s another piece of the lucrative Scrambler puzzle, but by no means the final piece. 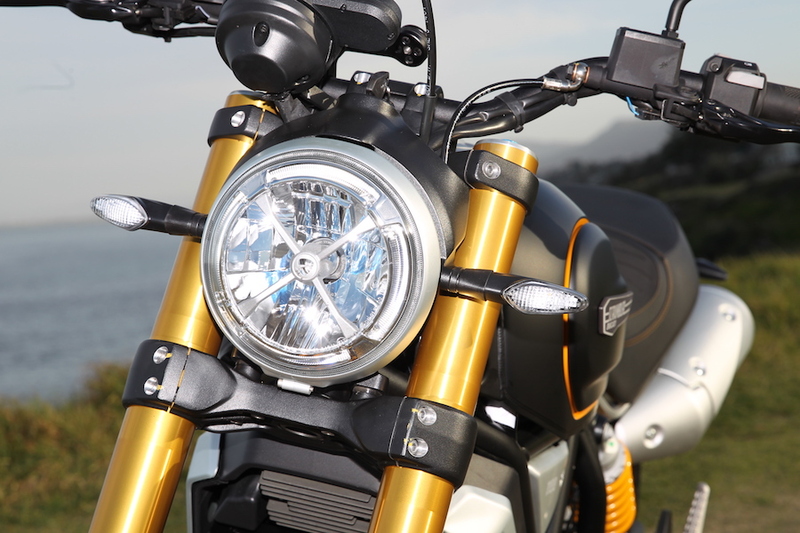 And the wide range of available 803cc Scramblers is a good indication of what we will probably see from the 1100 next.